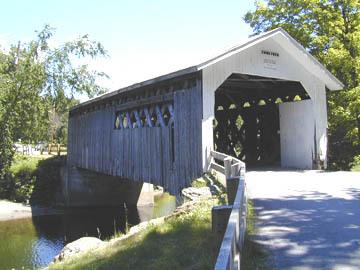 Wednesday, September 26 - Senator Jeffords announced that grants totaling $1.84 million will be made available to preserve and repair over 40 covered bridges in Vermont. The grant comes from the National Covered Bridge Preservation Program sponsored by Jeffords. - Montgomery's Comstock Bridge: $576,000, a 72-foot Town-lattice truss bridge over the Trout River, built in 1883. - Pittsford's Cooley Bridge: $200,000, a 68-foot Town-lattice truss span over Furnace Brook, built in 1849. - Jointly owned Gorham Bridge of Pittsford and Proctor: $576,000, 129-foot Town-lattice span over Otter Creek, built in 1841. - Thetford's Sayers or Tucker Hill Road Bridge: $24,000, 130-foot truss with arch, a possible adaptation of the truss patented by Herman Haupt in 1839, over the Ompompanoosuc River, build date unknown. As of this date, all of these bridges are in use, except for the Gorham, which is closed to traffic with Jersey barriers in place. 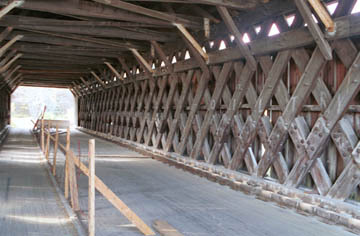 The Comstock Bridge was inspected during the Covered Bridge Study concluded in the spring of 1995. The inspectors recommended that the community "continue use of the bridge for light vehicular traffic, with heavier truck traffic diverted to other routes . . ." The estimated cost of needed repairs at that time totaled $55,000, contrasted with the $576,000 to be provided by the recent grant. Jack Truss and repair chords; Realign and repair chord at bearing area, downstream side of abutment 2; Repair concrete cap on abutment 2; Repair roof; Improve guard rails; Add signs. The bridge also has a distribution beam installed under the floor beams. Designed to force the participation of adjacent floor beams in supporting axle loads of vehicles, and found to add only to the dead weight of the bridge, it has been VAOT policy to remove these whenever deck-work needs to be done. When the recommended work is completed, the inspection report states that the carrying capacity of the bridge will increase from three to six tons. Vermont Covered Bridge Study at the Comstock Bridge - Highlights. The Inspectors of the Cooley Bridge recommended that the Town of Pittsford continue use of the bridge for light vehicular traffic, with heavier truck traffic diverted to other routes in the local road system. Alternatively, the bridge should be rehabilitated to safely support moderate traffic. The current capacity of the span is eight tons, sufficient for the first alternative. Rehabilitation, the second alternative, would increase the capacity of the bridge to twenty tons. The inspectors estimated that the cost of the work would be from $40,000 to $80,000 depending upon the option taken. Vermont Covered Bridge Study at the Cooley Bridge - Highlights. 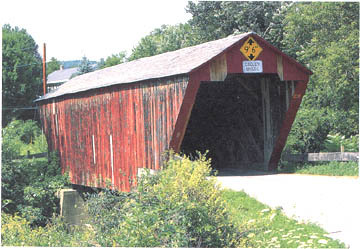 The inspection team offered the Towns of Pittsford and Proctor just one alternative for continued use of their covered bridge; to rehabilitate the structure to safely support "moderate" traffic. The current carrying capacity is estimated to be three tons. Rehabilitation would increase the capacity to twenty tons. The study states : "A more refined engineering investigation will be required to determine details and a cost estimate for this option." 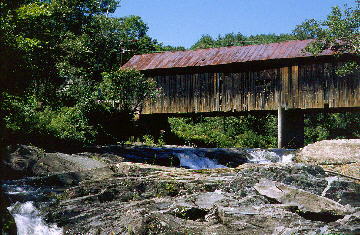 The Gorham Bridge has been closed to traffic, probably because the class of vehicle using the bridge regularly exceeds its three-ton capacity. Notice in the accompanying photograph that most of the truss-members in view have been spliced. The other truss is much the same. This method of repair was used to replace the lower ends of the truss-members when they became broken or rotted. The method more commonly encountered in Vermont is that of "sistering," inserting a new truss-member into the interstices between the existing members. Vermont Covered Bridge Study at the Gorham Bridge - Highlights. When the Sayres, or Sayers, or Thetford Center, or Tucker Hill Road Bridge was inspected, the Town of Thetford were offered two options for the continued use of their bridge; Continue use of the bridge for light vehicular traffic, with heavier truck traffic diverted to other routes, or close the structure to traffic and construct an adjacent bypass structure. The cost of repairs was estimated to be between $85,000 and $520,000, depending upon the option taken. Vermont Covered Bridge Study at the Sayres Bridge - Highlights.